2010 Lionel #15 Union Pacific Loco And Passenger Set. (QX8626, QX12023, QX12013) - $50.00 : Olson Hobbies, Welcome To The Train Page! 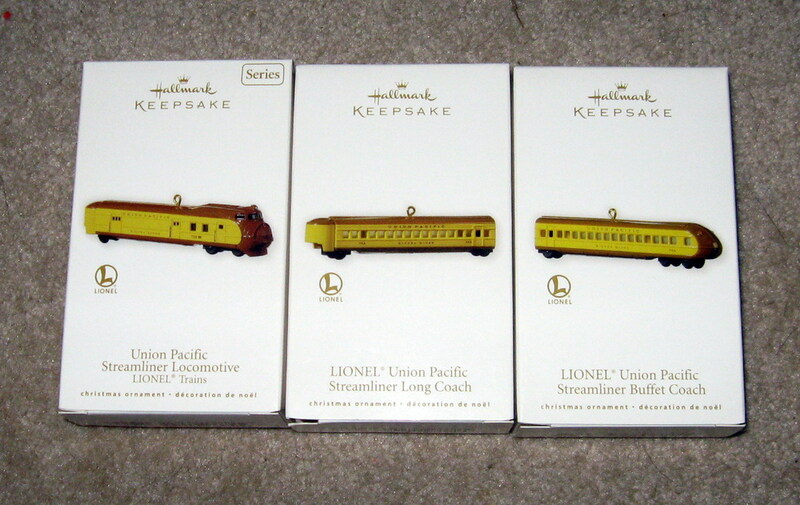 2010 Lionel #15 Union Pacific Loco And Passenger Set. Mint Condition 2010 Lionel Union Pacific Locomotive. This was the 15th in a series of Lionel Ornaments that were made. This Keepsake Ornament replicates the No. 751W (O Gauge Union Pacific Streamliner set, based on Union Pacific's M-10001 City of Portland train). The second car, No. 753, was a long passenger coach with room for 60. The third car, No. 754, served as a buffet car and passenger coach. Stock No. QX8626. Set comes with Union Pacific Passenger car, stock number QX12023 and Union Pacific Observation car, stock number QX12013.